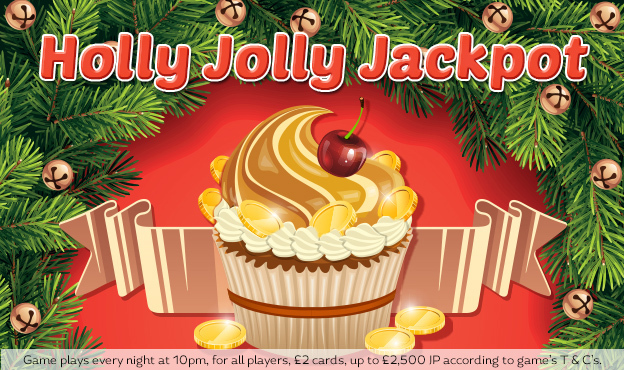 Hope you’re ready to get merry, roomies, because our Holly Jolly Jackpots are playing out daily @ 10p – and they can rise all the way up to £2,500 every night! Tickets are just £2 for these 75-ball sliding jackpot games, with these prizes guaranteed daily: FH: £300, 1TG: £100, 2TG: £100. You’re in for a very jolly festive season, sweeties! The following are the terms and conditions of the Holly Jolly Jackpot. This promotion is organsed by the company, as defined in the Terms and Conditions. Your participation in this promotion shall be deemed to constitute your complete acceptance of the terms and conditions below. It is a 75 ball bingo room. It plays every night at 10pm. Cards are £2 each. If there's more than one winner the jackpot will be shared. This is a shared game between the following brands: Moon Bingo, Robin Hood Bingo, Sugar Bingo, Polo Bingo, Loony Bingo, Gossip Bingo, Silk Bingo, Diva Bingo, Bingo Giving, Cupcake Bingo. The shared game basis enables the Company to bring together users of the game and other players who use the game operated by the Company. The Company reserves the right at any time, to cancel, modify, or suspend the Promotion and the prizes if, in its sole judgement the Promotion is not capable of being conducted as specified. The Company may terminate the Promotion at any time without prior notice.